Cursus bij Sotheby’s betekent naast lectures volgen, wealth rapporten doornemen en participeren in online discussies ook opdrachtjes volbrengen. De eerste essay opdracht luidde als volgt: bespreek een werk dat de laatste zes maanden verkocht werd tijdens een veiling bij Sotheby’s en hoe interne en externe factoren de prijs beïnvloed hebben. Uiteraard heb ik voor een kunstenaar van eigen bodem gekozen, die zelfs de wereldberoemde fotograaf Mario Testino wist te bekoren. “Mama, wat zijn ze daar eigenlijk aan het doen?”, vroeg mijn dochter spontaan na het zien van Two, waarmee ze meteen de nagel op de kop sloeg. En waarom betaalt men een paar miljoen meer voor die andere Borremans? Haal de taal van mister Darcy maar al van onder het stof en treedt binnen in de wereld van de veilinghuizen! 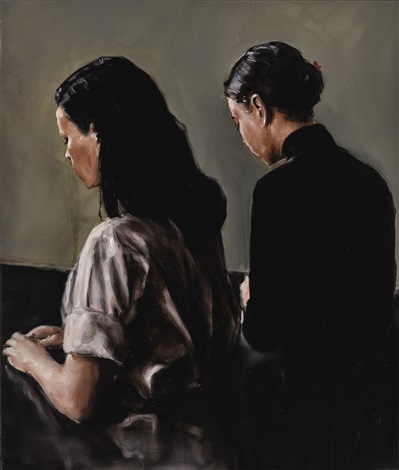 The painting Two by the Belgian artist Michaël Borremans was sold at an auction on 13th of September 2017 at Sotheby’s London for 827,750 GBP (hammer price with Buyer Premium). Far above the estimated 200,000 – 300,000 GBP. The famous photographer bought it in 2004 at the Zeno X Gallery in Antwerp, known for representing top Belgian artists like Luc Tuymans. Two was presented as lot 29 of 39 lots and hit the top price of the sale. It was the longest bidding contest of that sale and went finally to a telephone bidder. Provenance is a key internal factor in this case. Two was part of the collection of the famous photographer Mario Testino. In 2014 the painting was exhibited with other works from his collection in Turin at Pinacoteca Giovanni e Marella Agnelli. This exhibition, Somos Libres II was curated by Neville Wakefield, adding to the positive internal factors. The charity purpose of the sale contributed to the external factors. All the proceeds from the auction went toward the not-for-profit Museo Mate of Mario Testino, supporting cultural projects in Peru. So the auction in itself was unique. Fashion-savvy and starry bidders build interest in this sale located in London. But the American telephone bidders took the biggest part of the lots. The subject of the two women fits perfectly the enigmatic character of Testino’s images. Michaël Borremans is known for his mysterious and quiet surreal themes. Two depicts the women in that specific style. It’s a mysterious scene of Rückenfigur. The women are depicted from behind and one can only guess what they are doing. It certainly catches the attention of the viewer. Other significant internal factors are the medium, oil on canvas and the quality of the work. Borremans is known for his eye for detail. He handles skillfully the techniques and historic tradition of oil painting, like the old masters Friedrich, Vermeer and Velazquez. His themes are timeless and showcase his craftsmanship very well. Authenticity is covered because the work is signed, titled and dated by the artist. May 2017 the work Add and Remove was sold for 348,500 USD, hammer price with Buyer’s Premium (estimate 250,000 – 350,000 USD) during a Contemporary Art day auction in New York. It belongs to a private collection but didn’t reach the price level of Two, where provenance and the uniqueness of the auction clearly boosted the price. The subject of Add and Remove is less compelling than the two women, which represents better the enigmatic style of Borremans. Add and remove, 2002. Oil on canvas. 69,9 x 9,7cm. October 2015, Girl with Duck was sold for 2,045,000 GBP, hammer price with Buyer’s Premium (estimate 600,000 – 1,000,000 GBP) during a Contemporary Art evening auction in London. It catapulted Borremans as most expensive living Belgian painter. Just like Two, this painting had favorable provenance. It was sold by the Indonesian-Chinese billionaire collector Budi Tek, who bought it in 2012 at David Zwirner, New York. The subject, alluding to René Magritte’s surrealistic style, also influenced the value positively. It also excels Two because of its impressive size and the outstanding quality, being one of the most fully developed and exquisitely completed paintings by Borremans. 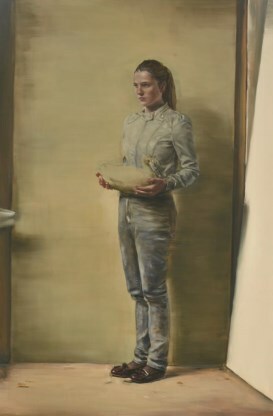 Jeffrey Grove, Michaël Borremans. As sweet as it gets. 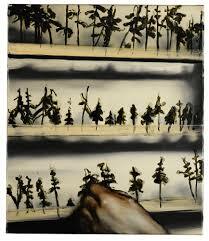 I really like Borremans’ work. Please get me one for Christmas. And as I’m not going to sell it during my lifetime, it doesn’t matter that I’m not rich and/or famous. Good read. Met kunst kan je nog rijker worden dan je al bent. Jammer dat de kunstenaar zelf die grote sommen geld niet ontvangt. Op dit niveau is het “business”. Als het echter een goed doel dient of een publiek belang heeft, heeft de maker er hopelijk ook iets aan. Mijn “mister Darcy taal” was ook eventjes vanonder het stof … “nice” artikel!